Jennifer Robson is the author of the new novel The Gown, which takes place in England in 1947. Her other novels include Somewhere in France and Goodnight from London. She lives in Toronto. 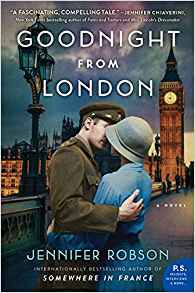 Q: You write that in post-World War II Britain, “For many people, life seemed to be getting worse, not better.” How did you recreate this period in your new novel, and what role did the 1947 royal wedding play at the time? A: It was the contrast between the two – the pageantry and joy of the wedding, set against a backdrop of everyday life that was unrelentingly bleak – that first caught my attention. I didn’t want to write yet another book about the royal family, since that ground has been covered pretty thoroughly; but I also didn’t think my readers would appreciate one long sob-fest about how dire things were in Britain after the war. 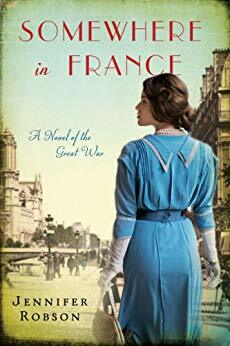 In terms of bringing the period to life, it was simply a matter of capturing the details of everyday life: the shortages, the queues, the terrible weather, and above all the way people resigned themselves to continuing on and making the best of things. Q: How did you research the actual gown worn by Princess Elizabeth, and did you learn anything about the British Royal Family that particularly surprised you? 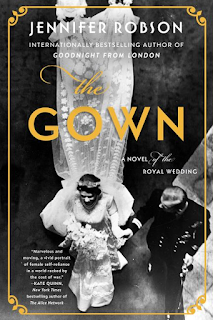 A: Most of my research was conventional enough, since there’s no shortage of information on the appearance of the gown, and as with any royal wedding the day itself is very well-documented in terms of photographs. I saw the gown when it was on display at Buckingham Palace as part of the “Fashioning a Reign” exhibit in 2016, and that was invaluable. But it was much harder to find out how the gown was made, for there was practically no trace of the embroiderers themselves in the historical record. No one interviewed them at the time, there were hardly any photographs of the workrooms where the gown was made, and Norman Hartnell’s personal papers and archive are held privately. I had to get creative with my research to fill in the gaps, so in early 2017 I went to England to learn how the embroidery was done – and not from anyone who had been at Hartnell, but instead from people who do such work today. I went to Hand and Lock, a renowned hand embroidery studio founded more than 250 years ago, and spent a day with one of their master embroiderers. That day gave me valuable insights into what it was like to do such exacting and tiring work, and also showed me that it’s intensely creative work. The embroiderers, I realized, were nothing less than artists. While I was at Hand and Lock, I learned there was one woman, Betty Foster, who had worked at Hartnell—a seamstress rather than an embroiderer, which I suppose explains how I’d missed her before—and she was willing to speak with me. The very next day I travelled out to Essex to meet her, and she was the person who opened the door for me. It was Betty who told me what it was really like to work at Hartnell, and who shared all sorts of lovely details about the work and Mr. Hartnell and, of course, the royals. One detail I loved was the queen’s thoughtfulness (and here I mean the Queen Mum). She always made a point of thanking the women who made her gowns, and on one occasion Betty and some of the other women from Hartnell were invited to Buckingham Palace so they might see the queen in the gown they had made. Q: How did you come up with your characters Ann, Miriam, and Heather, and did you focus more on one character’s story at a time and then move things around as you wrote, or write it in the order in which it appears? A: Ann and Miriam came to me very early in the process, and their voices were so clear there were times I felt as if they were shouting at me. It was only as I came to the end of planning the book that I realized I wanted a modern-day voice to act as a contrast, or perhaps complement, to theirs—and I knew immediately that it had to be the granddaughter of one of them. When I got to writing I did so in the order the chapters appear, although I did find I needed breaks in order to ensure their voices remained true to their characters. Q: What did you see as the right blend between the fictional and the historical as you wrote The Gown? A: As with all my books, the fictional elements are something that act as an overlay to the documented history; you might also say that history is the fabric and my fictional additions are the embroidery. In The Gown, I did have to invent characters for the purposes of establishing a dynamic narrative, but my intent, always, was to ensure that my creative additions fit seamlessly into the real world I was describing. With the people who worked at Hartnell, for instance, the only person about whom we know much of anything is Mr. Hartnell. So he is as true to life as I could make him; other characters, like Miss Duley, are fictional imaginings of real-life figures whose names and not much else are known; and the central characters, of course, are my own creation. I think the moment I realized I had succeeded in weaving them all together was when my husband looked up from an early draft and asked me how I’d found out about Miriam Dassin and her work—he assumed she was real. He was actually pretty disappointed when I confessed she was a product of my imagination! A: I’m still at the very early stages of writing my next book, and as such I’m feeling a little cagey about discussing it. I can say that the main characters are two sisters. I’m very close to my own sister, and I started thinking, some months ago, that I needed to explore the relationship between two very different sisters for my next book. It’s set for the most part in England, again with war as its backdrop, and that’s about all I can say for now. But there will be tea—I can’t imagine ever writing a book without characters who are making, drinking, or thinking about their next cup of tea! --Interview with Deborah Kalb. 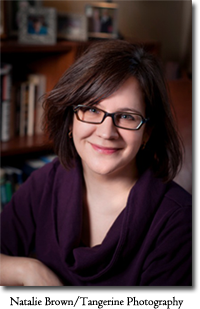 Here's a previous Q&A with Jennifer Robson.